Revision and revisionism are generally seen as standard parts of historical practice, yet they are underexplored within the growing literature on historiography. In this accessibly written volume, Marnie Hughes-Warrington discusses this paucity of work on revision in history theory and raises ethical questions about linear models and spatial metaphors that have been used to explain it. 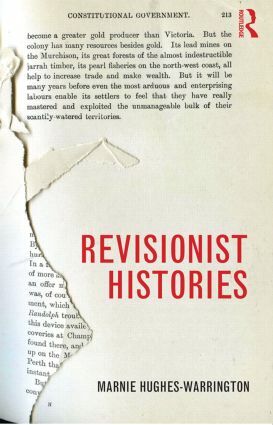 Revisionist Histories emphasises the role of the authors and audiences of histories alike as the writers and rewriters of history. Through study of digital environments, graphic novels and reader annotated texts, this book shows that the ‘sides’ of history cannot be disentangled from one another, and that they are subject to flux and even destruction over time. Incorporating diverse and controversial case studies, including the French Revolution, Holocaust Denial and European settlers’ contact with Native Americans and Indigenous Australians, Revisionist Histories offers both a detailed account of the development of revisionism and a new, more spatial vision of historiography. An essential text for students of historiography.